It is easy to understand the name of the Orange Skunk Clownfish because of the white skunk like band that runs from the tip of the nose on the dorsal (upper) part of the body to the beginning of the caudal (tail) fin. Two other species of clownfish belonging to the “skunk complex” have this feature including the Skunk Clownfish (Amphiprion akallopisos) and the Pink Skunk Clownfish (Amphiprion perideraion). The Orange Skunk Clownfish has an orange body. Juvenile Orange Skunk Clownfish have a transparent or whitish tail, but as they grow the tail turn an orange color. 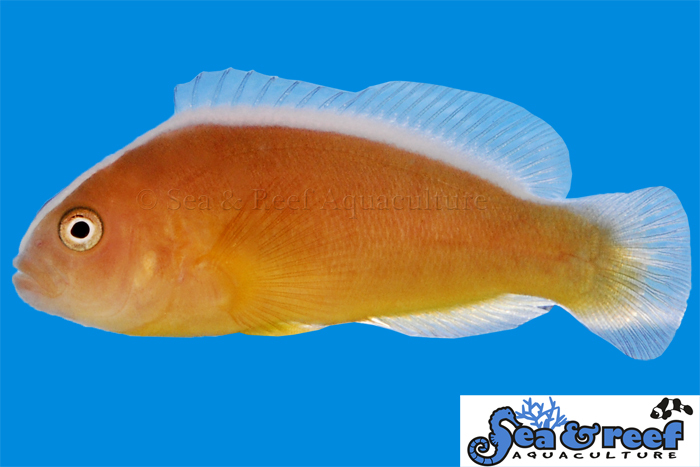 The orange tail is an easy way to distinguish adult specimens of the Orange Skunk Clownfish from the Skunk Clownfish and Pink Skunk Clownfish since these other species have a white or light colored caudal (tail) fin. Also, the Orange Skunk Clownfish grow larger than the Pink Skunk Clownfish but is still one of the smallest species in the clownfish family. It is hardy and also very peaceful. The Orange Skunk Clownfish has a wide distribution. It can be found west to the Solomon Islands to the east coast of Sumatra, north to Ryukus and south to northern Australia. The Orange Skunk Clownfish is very peaceful and hardy, but can be a little timid. If housed with more aggressive fish species in a community tank we recommend adding the Orange clownfish early so they have a chance to establish a territory before adding more aggressive species. Adding an anemone that the Orange skunk clownfish can inhabit will help them become more comfortable in your tank. In their natural environment Orange Skunk Clownfish are typically hosting in the Sebae Anemone (Heteractis crispa) or Merten’s Carpet Anemone (Stichodactyla mertensii). Captive bred Clownfish do not require host anemones to survive or thrive. However, in most cases they will readily accept them. The Orange Skunk Clownfish is not picky when it comes to anemones and will readily host in a number of anemone in captivity. We recommend the popular and hardy Bubble Tip Anemone (Entacmaea quadricolor).